As long running series such as Adventure Time and Regular Show come to their ends, its time for Cartoon Network to bring new talent and fresh new series to our screens. One such show is Summer Camp Island. The series is the creation of Julia Pott, a US-based British animator and artist who worked as a staff writer on Adventure Time. As the title suggests, it features children attending a summer camp. However, it quickly transpires this is no ordinary camp. As soon as the grown-ups are out of sight, it's revealed that the camp counsellors are witches- and magic is real on this island! Although there is a vocal contingent who like to grumble that all current Cartoon Network series look the same, this is further proof that that is simply not true. Although the series' style does have some similarities with Adventure Time, it also looks different enough to give it a distinctive identity. This will be only the second series on the network to be created solely by a woman (after Rebecca Sugar's Steven Universe). They also released a sneak peek of the intro, which was animated by Masaaki Yuasa's studio Science Saru (Lu Over The Wall, Devilman Crybaby). The series will feature characters who originally appeared in another form in two of Potts independent shorts, The Event and Belly. 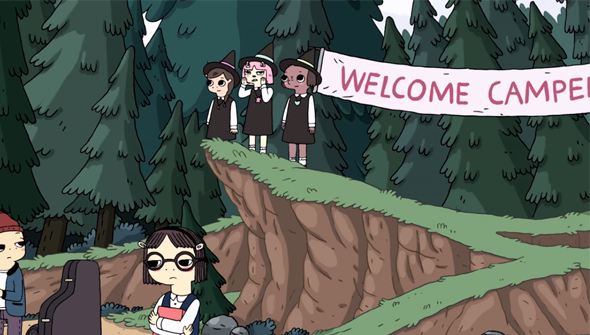 Potts then directed a pilot of Summer Camp Island, which screened at various festivals in 2016 and 2017. The pilot was released online in April and serves as a good taster of what to expect from the final show. Check it out below.